Bailey May on copying Daniel Padilla: "If they say that, I don't think I am." 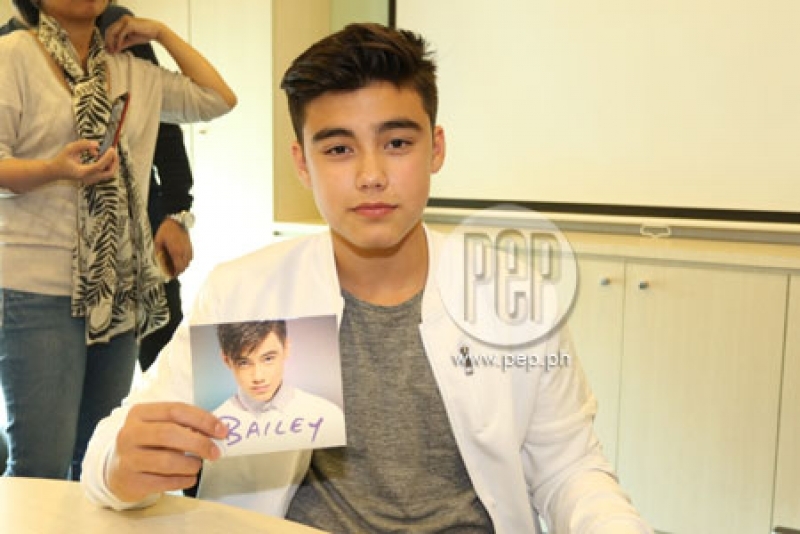 Bailey May says it's a dream come true for him to release his first self-titled album. The PBB alumnus wants to collaborate with James Reid, Darren Espanto, JK Labajo, his love team partner Ylona Garcia, and Daniel Padilla, the original interpreter of the song he covered online, "Nasa 'Yo Na Ang Lahat." Bailey May fulfills his dream of becoming a recording artist with the launch of his self-titled album under Star Music. Before entering the Big Brother house, Bailey became an Internet sensation for doing covers and posting it online, when he was still based in England. When he joined Pinoy Big Brother 737, the 13-year-old Fil-Brit performer emerged as the Fourth Teen Big Placer. During a digital media conference for Bailey’s album earlier today, January 19, the young recording artist said it's a dream come true for him to have an album. "Having my album has always been a dream for me ever since I started singing. "So to be able to have it now, it’s a blessing." This song became viral and made Bailey an Internet sensation. His songs “Can You Be My Girl” and “Gusto Kita” are compositions of Inspirational Diva Jamie Rivera. Bailey says about working with Jamie, “She’s one of the very famous singers in the Philippines and to be working with her is a blessing. He recalled the advice he received from the inspirational diva. “And about singing, if you're singing a song, you have to feel it. Bailey said that his musical influences include One Direction, Jireh Lim and Justin Bieber. Aside from Jamie Rivera’s compositions, Bailey's album also includes original songs “Boom Goes My Heart” and “Gotta Win,” a revival of The Foundations’ “Build Me Up, Buttercup” and Khalil Ramos’ song “Now We’re Together,” which was also used as a love theme song in PBB 737. DANIEL PADILLA. Bailey was then told that there are some observers saying that he somewhat exudes an aura similar to Justin Bieber. What can he say about this? “I started hearing that last year [but] I didn’t do it in purpose. Since he did a cover of Daniel Padilla’s song, there are also speculations that he might be imitating Daniel's style. However, Bailey clarified, “If they say that, I don’t think I am. Is Bailey open to doing a collaboration with him? The "Global Gwapito ng UK" (his tag in PBB 737) also wishes to collaborate with James Reid [his co-star in On The Wings of Love], Darren Espanto, and JK Labajo. He was also asked if he will be doing a collaboration with love team partner and fellow PBB 737 ex-housemate Ylona Garcia. WORKING WITH JADINE. Aside from working on this album, Bailey was recently cast in the ABS-CBN teleserye On The Wings of Love, which stars James Reid and Nadine Lustre. The teen actor said that being part of a teleserye is something that is proud of. “It’s a blessing because before PBB, I was watching these stuff on TV [teleseryes] and I never expected myself to be on it. For him, working with JaDine is also a blessing.